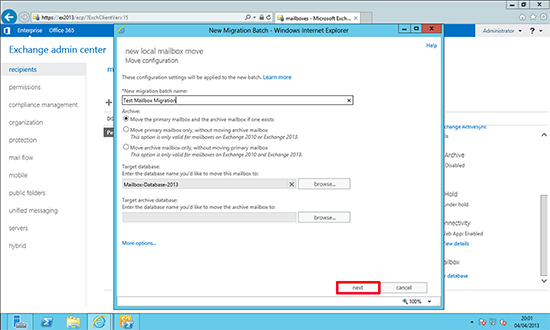 To complete a migration from Exchange 2010 (or 2007) to Exchange 2016/2013, you need to introduce Exchange 2016 into your existing Exchange environment, then migrate your content onto the new server(s), and finally remove Exchange 2010. 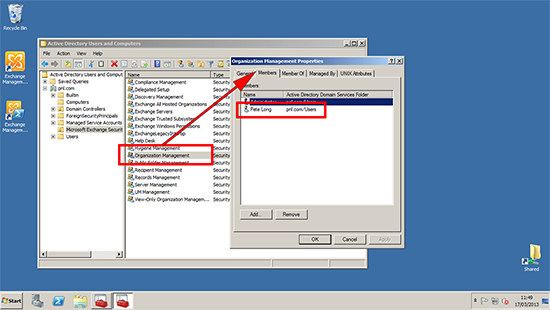 In this example I’ve got an existing Exchange 2010 environment running on Windows Server 2008 R2. 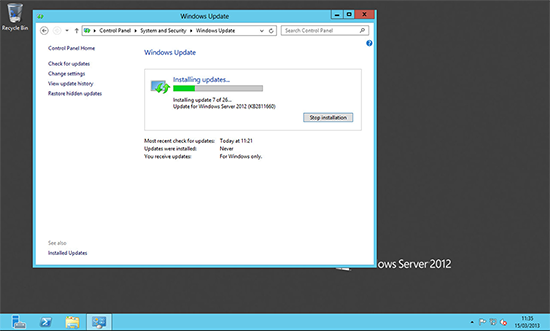 I’m putting in Exchange 2016 onto a new server running Server 2012. Post install the NEW server will hold client access, and mailbox roles. 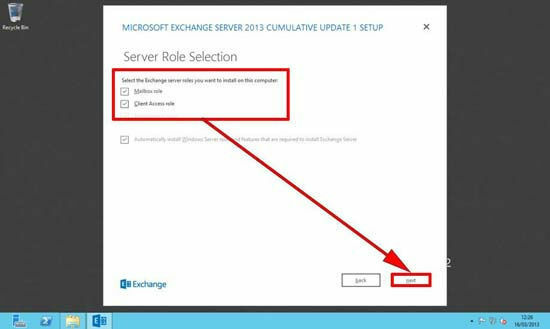 Unlike with previous versions of Exchange, the 2016/2013 approach is NOT to split up roles to different servers, it’s considered good practice to deploy all roles on all Exchange servers. 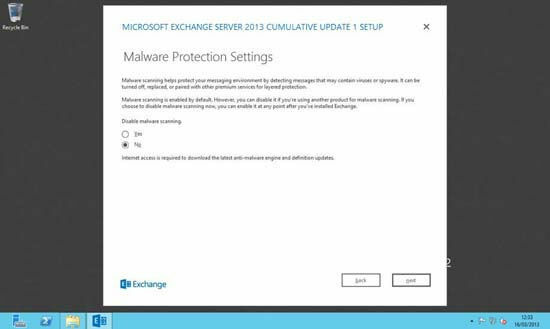 Unless you have Microsoft “Software Assurance” you cannot simply upgrade to Exchange 2016 for free. You will need to buy the Exchange 2016 Base product. You may wish to look at an “Open Value Agreement”, which lets you pay the cost over a three year term. The Exchange 2016 (on-premises) software itself comes in two flavours, Standard and Enterprise. 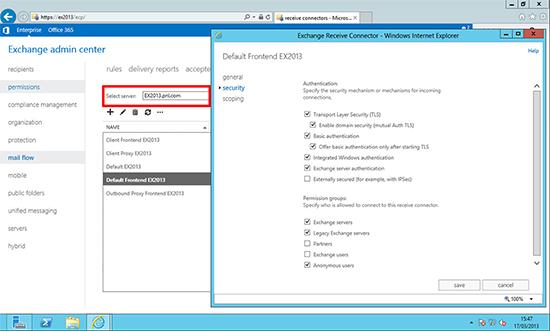 Standard: For small Exchange deployments (1-5 Mailbox Databases) and for non mailbox role servers in larger Exchange deployments. Enterprise: For large Exchange deployments (1-50 Mailbox Databases). 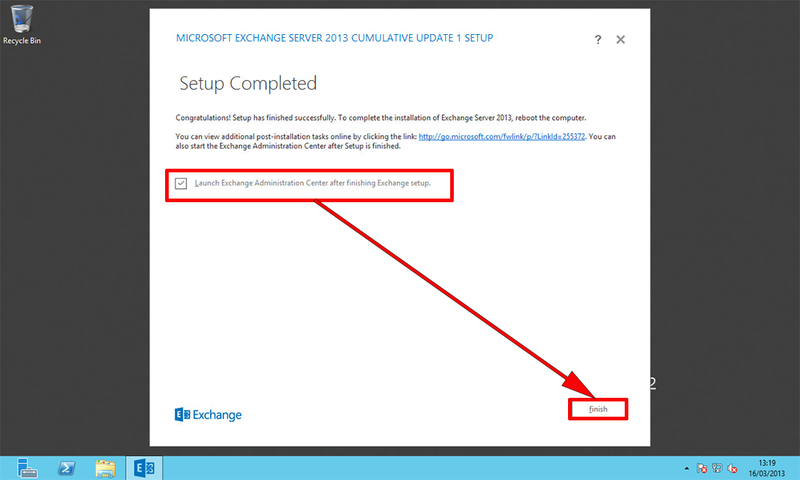 As before there are two types of CAL for Exchange 2016 access. These are also ‘confusingly’ called Standard and Enterprise. Note: An Enterprise CAL is NOT just for Exchange Enterprise 2016 and a Standard CAL is NOT just for Exchange Standard, this is a common mistake. Though you can mix and match, i.e. 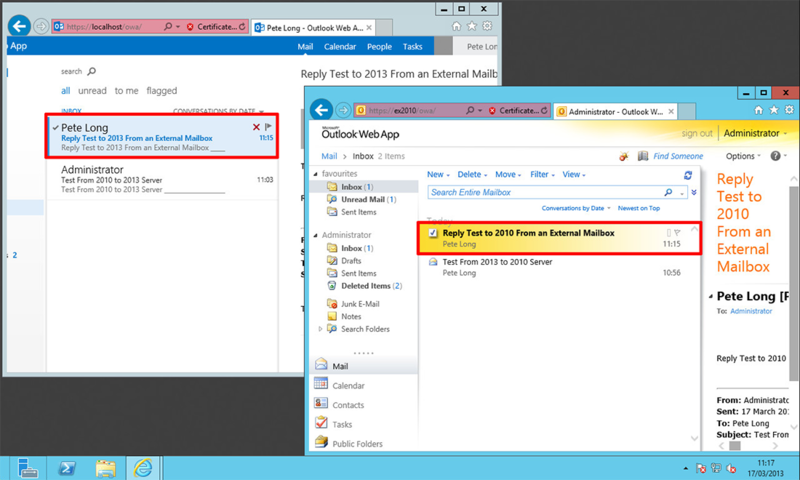 a standard CAL is required for all mailbox users or devices, adding an Enterprise CAL is only required for those existing users or devices requiring additional functionality. Standard CAL: Required for all users (or devices) that require access to an Exchange mailbox. For most people these will be the CALS you need to purchase. 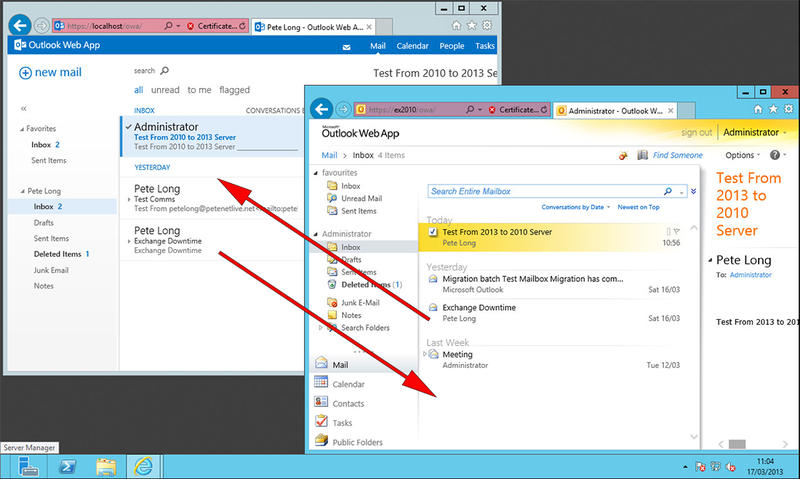 Enterprise CAL: Is an additional license that’s added to the Standard license, this enables the user to use archiving/journaling and unified messaging (Requires Outlook 2013). 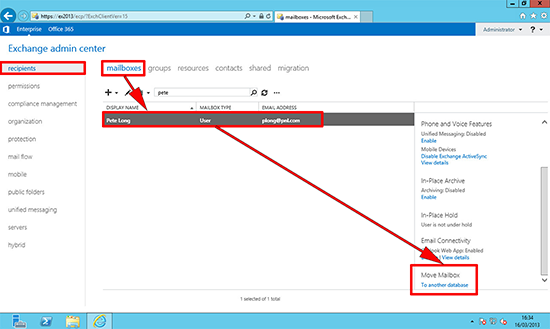 It also gives access to more advanced ActiveSync management policies and custom retention policies. 1. 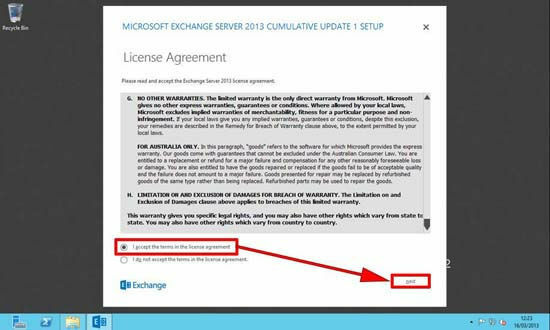 Media and Licenses: Before you start you will need to have the Exchange 2016 or 2013 CU2 (CU1 = Minimum) version of the install media (.iso or DVD). 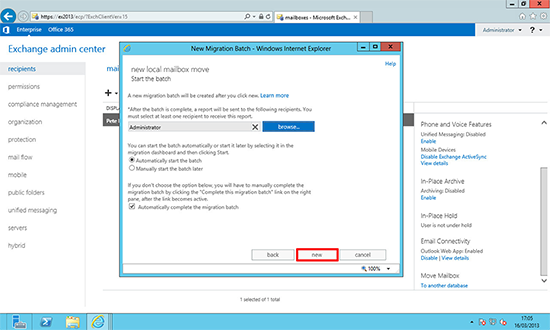 DO NOT attempt to perform the migration with a version of Exchange 2013 media that IS NOT at least CU1. Warning, this will be a DVD image (over 3.5 GB), you may wish to get this downloaded from a site with a decent Internet connection! 2. 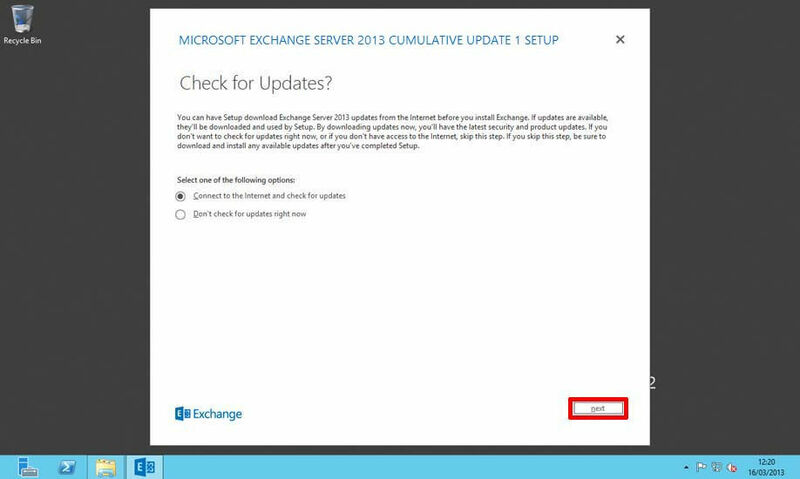 Make sure any third party Exchange software you are currently running is also supported on Exchange 2016, e.g. Anti Virus, Backup Solutions, Archiving, Mail Management, Mobile Device Software, etc, check with the software vendor. 3. 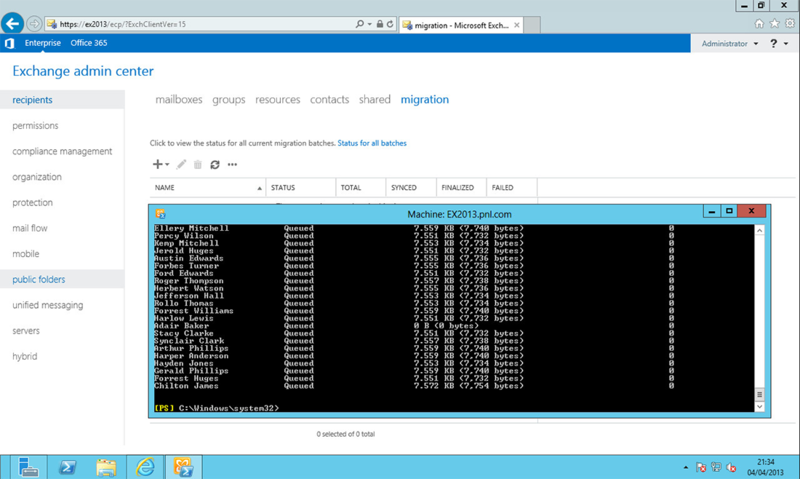 DO NOT CONSIDER migrating anything until you know you have a good backup of your current Exchange environment. 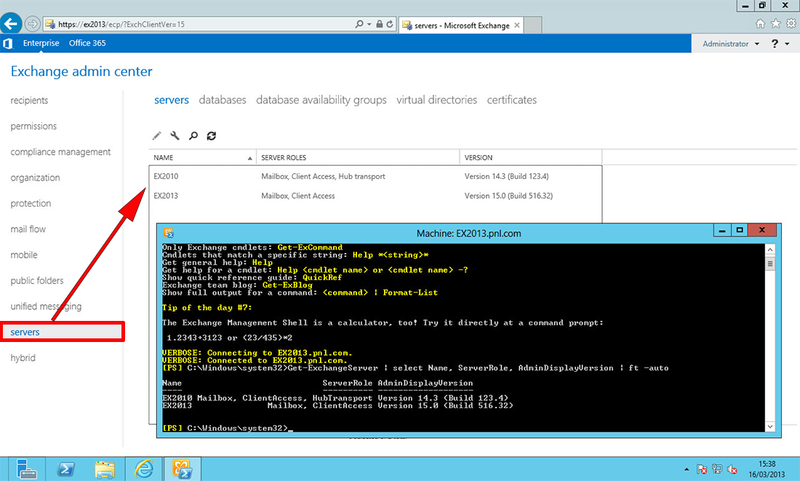 If you are lucky enough to have VMware ESX, Hyper-V or another virtualisation platform, consider doing a P2V conversion on your Exchange 2010 server then simply turning the 2010 Server off, then if it all goes to hell in a hand cart simply turn the original server back on again. 4. Outlook Client Access: Be aware your clients need to be using the following versions of Outlook BEFORE you migrate them. 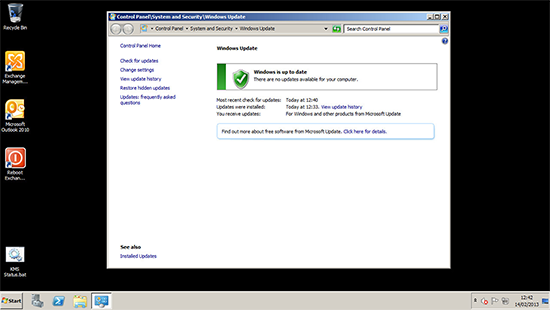 Outlook 2007 (With SP3 and this update). Entourage 2008 for Mac, Web Services Edition. 1. Before you do anything, it’s time for a common sense check, make sure your existing Exchange 2010 Organisation is happy and running cleanly, and has good communication with both the domain and your DNS. Get in the event logs and make sure it’s a happy server. Time spent on reconnaissance is seldom wasted! 2. Run a full Windows update on your existing Exchange server(s), this will install any Exchange roll-ups that are outstanding. 3. 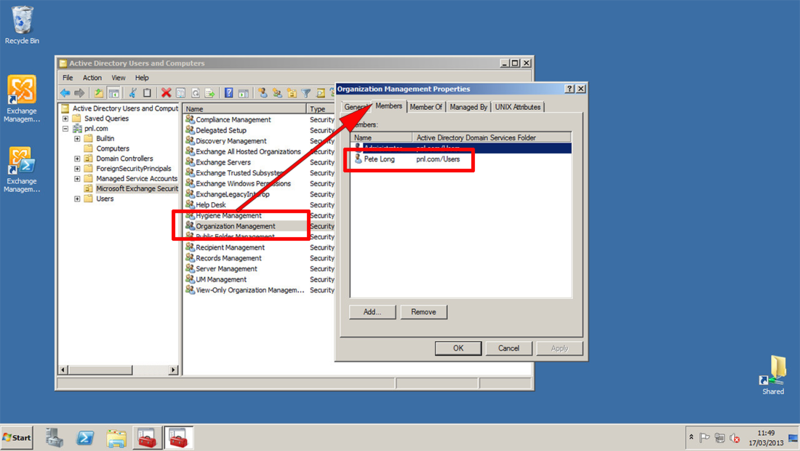 If you are planning to utilise DAG, then you should install the following hot-fix on your Exchange 2010 servers before deploying SP3. 4. 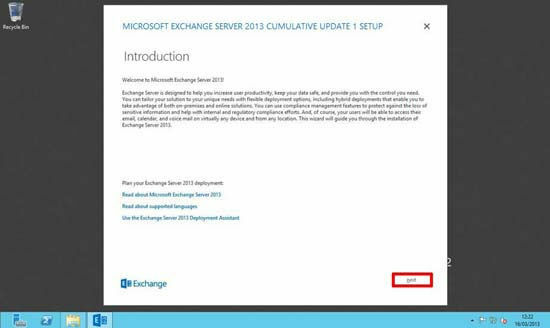 For coexistence of Exchange 2010 and Exchange 2016/2013, Your Exchange 2010 Servers must have Service pack 3 installed. If you are upgrading from service pack 1 you may see the following error. 5. 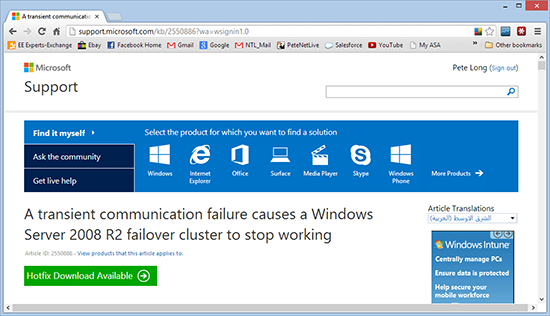 After SP3 apply the latest Update Rollup, (at 03/06/13 currently Update Rollup 1) download. 1. The server that will run Exchange 2016, will need to be a domain member*, and I would run all the current updates before you start. Once that is complete there are a number of server roles that will need adding. 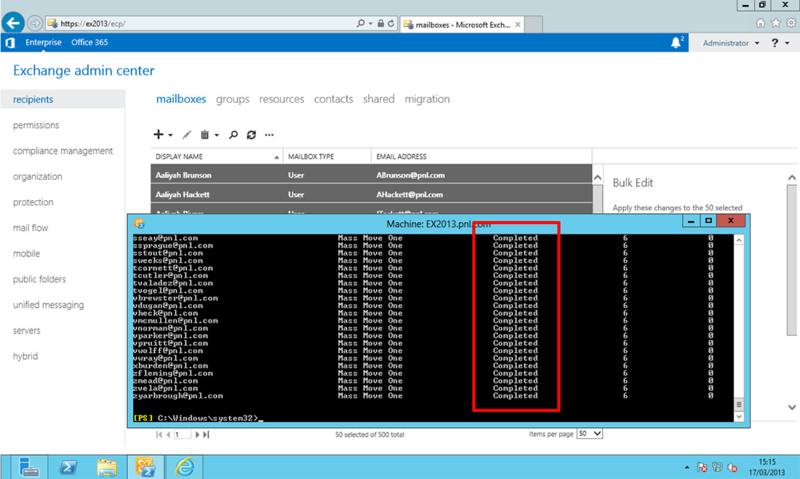 (Note: in Exchange 2013 these roles are the SAME for both CAS and Mailbox Servers, in 2016 there is only mailbox and edge servers anyway). 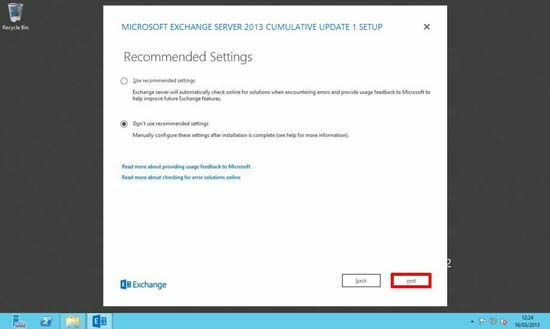 *Note: As with previous versions of Exchange it is recommended that you DO NOT run Exchange 2016 on a domain controller. 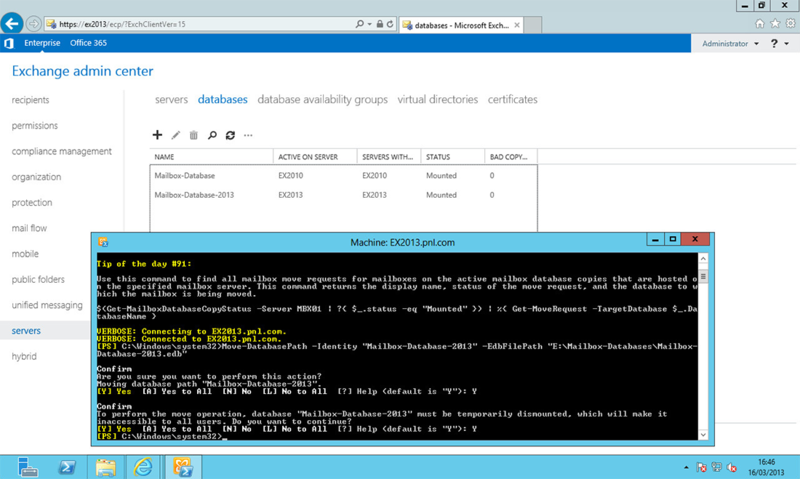 Note: Here on my ‘Test Network’ the server in question is also a domain controller. In your production environment this will probably NOT be the case. If so, you will need to install the Remote Server Administration Tools for Active Directory. 2. 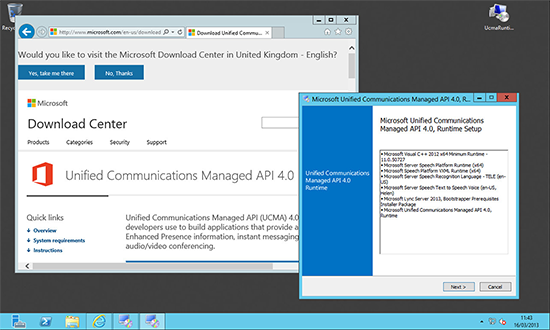 You will need to install the Microsoft Unified Communications Managed API 4.0, Core Runtime 64-bit. 3. 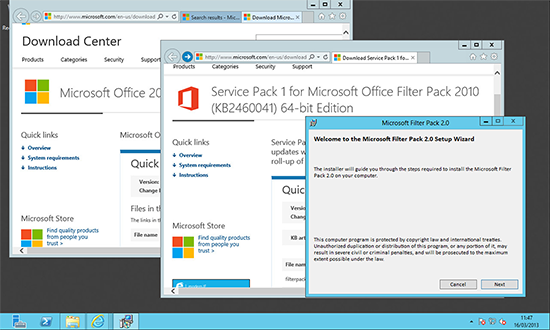 Exchange 2013 Only: You will also need to install the Microsoft Office 2010 Filter Pack 64 bit and Microsoft Office 2010 Filter Pack SP1 64 bit. 1. Insert the DVD or open the install files and run setup.exe. It will attempt to find any outstanding updates before it starts. 3. Setup will begin copying files. 5. Accept the EULA > Next. 6. I tend to disable feedback, but the choice is yours > Next. 7. Select the server roles that you wish to install. 8. Select the folder that you wish to install the Exchange program into. 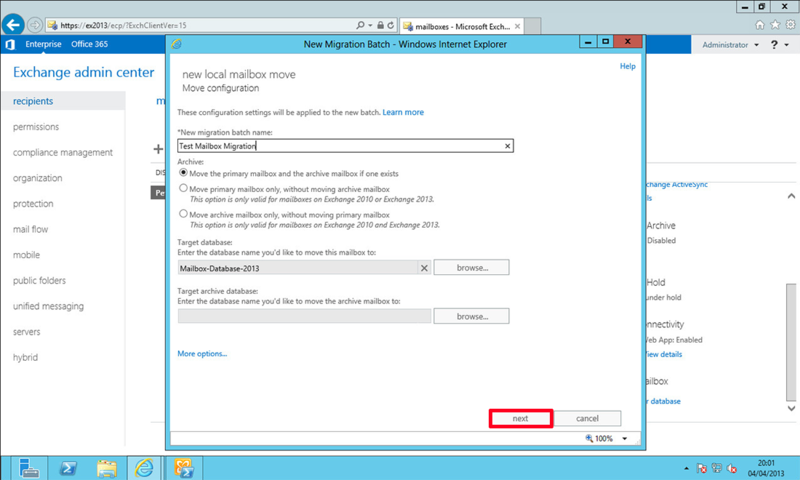 Note: Remember if deploying multiple Exchange 2013/2016 servers, it’s considered good practice to keep the folder paths contiguous across all the servers. 9. If you plan to deploy third party malware protection (post Install), then you might wish to disable this, but in most cases you will want it enabled > Next. Note: This is built on technology that was called ‘Forefront’ in previous versions of Exchange. 10. 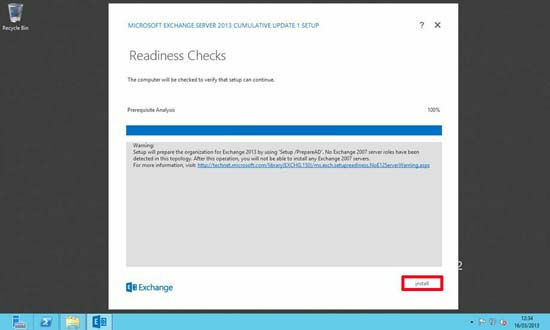 Pre deployment readiness checks will be carried out > when complete > Next. 11. Setup will take quite some time. 12. When complete, tick the box to launch the admin console > Finish. 13. 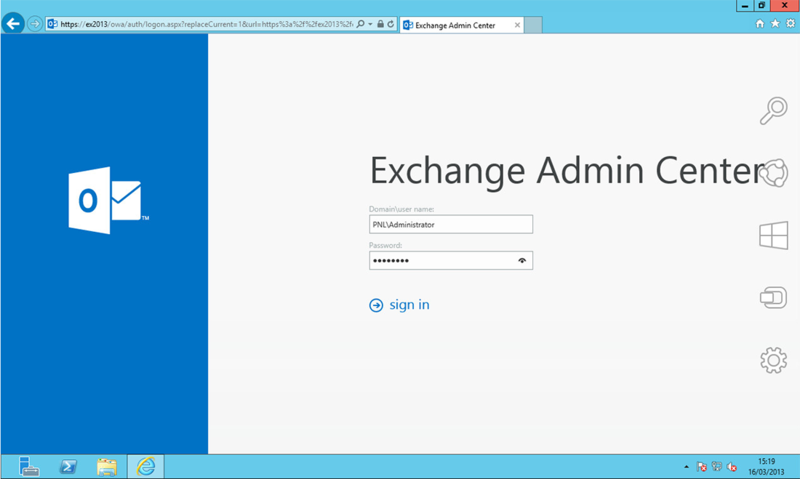 After a few seconds the Exchange Admin Center will open. STOP! Before you proceed you need to think about OWA access. For internal access this will not be a problem BUT if you have users that access OWA externally (e.g. via https://mail.yourpublicdomain.com/owa) Then you will have to DO SOME PLANNING. Unless you have two free public IP addresses, your router/firewall can only point to one CAS server at a time. 1. First make sure that the new server can see the existing Exchange infrastructure. From within the Exchange Admin Center > Servers. 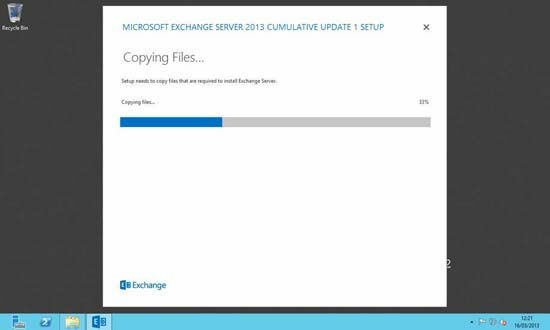 You should see both your Exchange 2010 Servers and the new Exchange 2016 Server. 2. 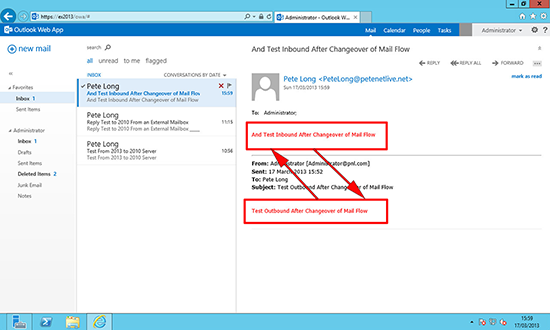 Test move one mailbox from Exchange 2010 to 2016, Recipients > Mailboxes > Locate our Test User > Move Mailbox. 3. Give the test migration a name, and browse to the new datastore (Note: If the move fails you can increase both the BadItem limit and the LargeItem limit here as well) > Next. 5. 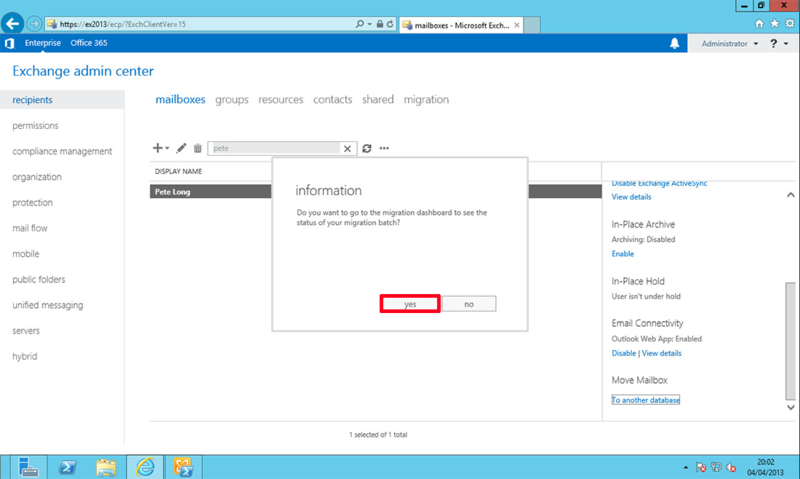 You will be asked if you want to the ‘Migration Dashboard’. 6. Here you can watch progress (remember to keep hitting ‘refresh’). Depending on the amount of mailboxes this can take a while! 8. 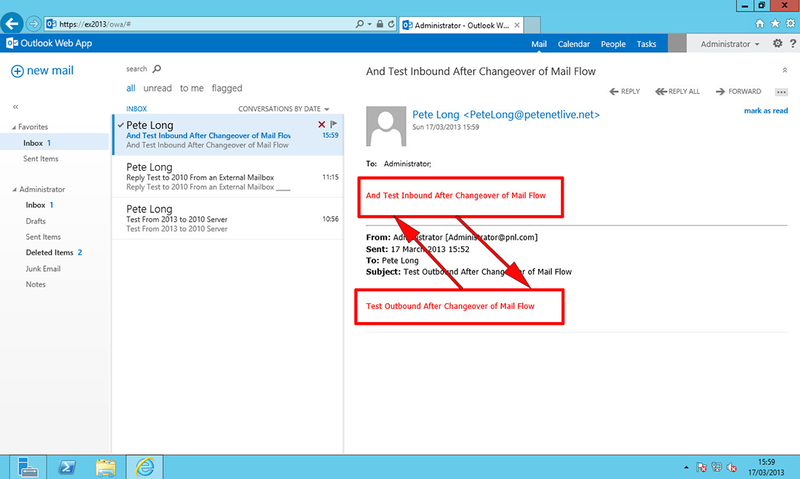 Then test mail flow to/from this mailbox to internal recipients in the Exchange 2010 infrastructure, and then test mail flow to/from an external mailbox. 9. 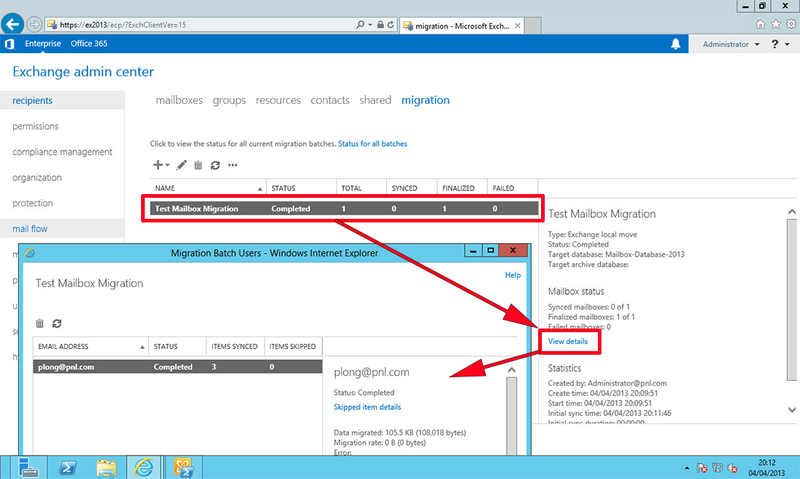 You can now migrate the remainder of your mailboxes. i. Change the SMTP (TCP Port 25) Port redirect on your router/firewall. ii. 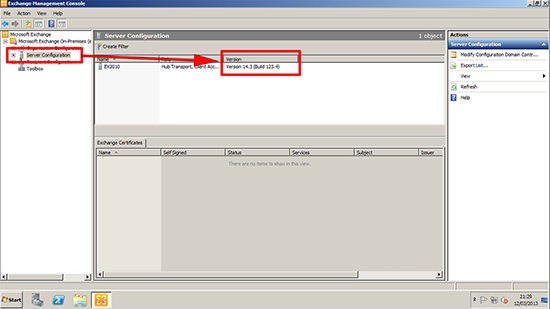 Swap IP addresses from the old to the new server. iii. Change the translation from public to private IP address to point to the new IP. Note: If you have any mail scanning servers, anti spam hardware devices etc, then they will also need changing to point to the new server. 1. 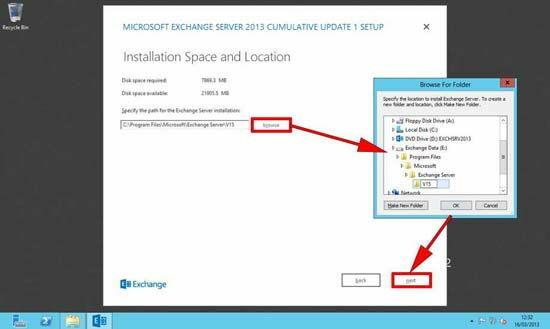 You will need to add the new server to your Exchange ‘Send Connector’ and remove the Exchange 2010 Server. (Note: I’m assuming you only have one send connector, if you have more than one i.e. for particular domains, or for secure TLS mail you will need to do these as well). 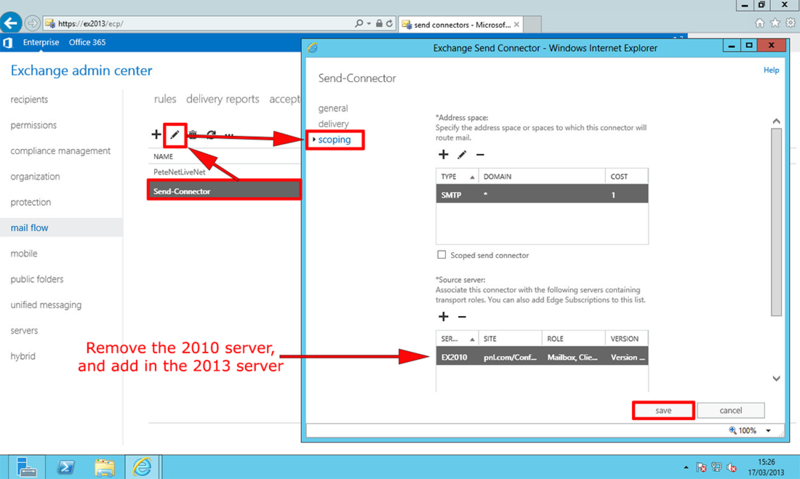 From Exchange Admin Center > Mail flow > Send connectors > Select the send connector > Edit > Scoping > Add the 2016 server > Remove the 2010 server > Save. 2. 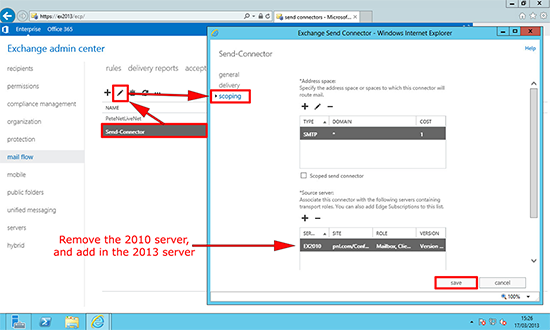 You will not need to create receive connectors on the Exchange 2016 Server, if you navigate to mail flow > receive connectors > Change the drop down to point to the Exchange 2013 Server. 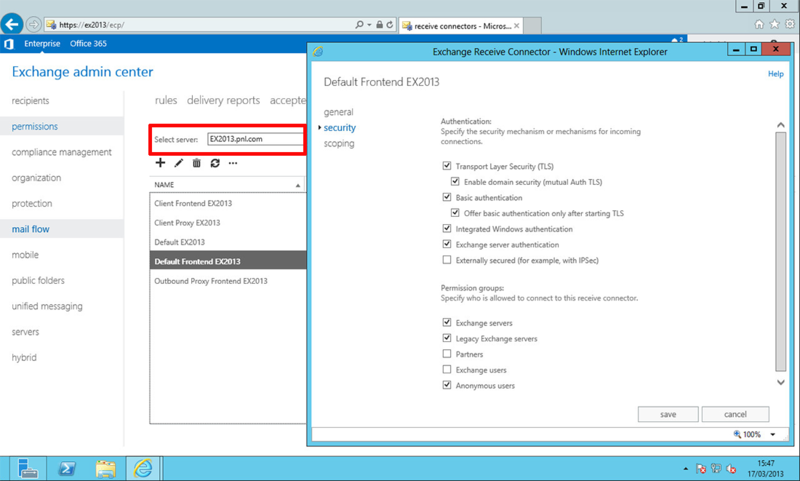 You will see there is a ‘Default Frontend’ Connector already configured for Exchange 2016. 3. At this point, it would be sensible to once again check mail flow, to and from an external mail account. 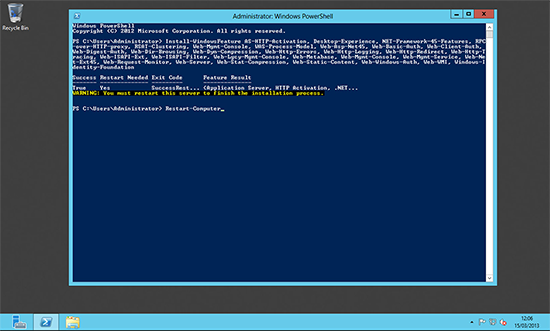 Thanks to Austin Weber for spotting my PowerShell typo. 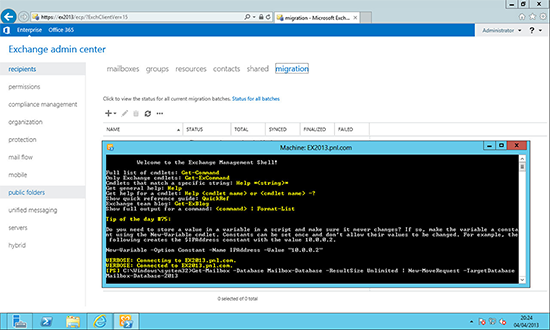 Thanks to Tony Blunt for the log file PowerShell syntax omission.